This week our series tip is Gilmore Girls! I'm writing this now because there will be a new miniseries of Gilmore Girls soon! Exciting isn't it? It's called 'Gilmore Girls: A Year in the Life'. There will be 4 episodes of 90 minutes. 25 November you can find these episodes on Netflix! So I decided this was a good moment to discus Gilmore Girls. 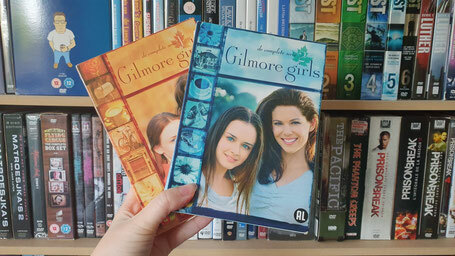 Tell me in comments, how many of you have sen Gilmore Girls? I have watched it, but I didn't watch every episode. It was still in a time when I only watched things on TV. And I didn't always have the time to watch. So occasionally, I watched some episodes of Gilmore Girls. Now I've started to watch the seasons completely on Netflix! Okay, now over to the plot! The series follows a mother (Lorelei Gilmore) and her teenage daughter (Rory). The show is completely about both of them and their relationship. General themes are love, work, education and social class. Lauren Graham plays the role of Lorelei Gilmore (Rory's mother). She was born in Honolulu (Hawaii). She starred in quite some other series as well. For example Townies (as Denise Garibaldi Callahan), Carolina in the City (as Shelly) and Parenthood (as Sarah Braverman). Rory is played by Alexis Bladel. Alexis is an American actress and model. She's mainly known for this role in Gilmore Girls. But she also starred in the Sisterhood of the Traveling Pants ( as Lena Kaligaris), Sin City (Becky), the TV series Mad Men (as Beth Dawes) and Bride and Prejudice (as Georgina 'Georgie' Darcy). I think Alexis Bladel is really awesome in Gilmore Girls! Any other names that to mind when you're thinking about Gilmore Girls? Well, how about Melissa McCarthy? I saw her recently in the movie 'Spy' with Jason Statham. She also played in the 2016 Ghostbusters movie and the comedy movie The Boss. Yeah, she played in Gilmore Girls as well! She was Sookie! Lorelei's best friend. Sookie is enthusiastic, fun and an amazing chef! Other cast members are Keiko Agena (Lane Kim), Scott Patterson (Luke Danes), Michel Gerard (Yanic Truesdale), Kelly Bishop (Emily Gilmore) and Edward Herrmann (Richard Gilmore). Gilmore Girls is a comedy/ drama series! It's funny, light and amusing. If you enjoy watching the mother daughter relationship develop this is certainly a series for you! They have an unique relationship and it's fun to watch them go through life. It's all about, love family, education, work, daily life. I love the tag line. It's: "Life's short. Talk Fast". And that fits the series completely. Rory and Lorelei are unique, funny and great to watch. They're so enthusiastic, chaotic, sometime clumsy and way more! You'll always be curious what they'll do next. They are each others best friends and they always find a positive way to see things! There were 7 seasons. The show aired from 2000 and 2007. In 2016, the 8th season will air. It will be a mini series called 'Gilmore Girls: A Year in the Life'. There will be 4 episodes of 90 minutes. I like the series. It's not a typical series that gets me hooked. That needs some serious cliffhangers and real unexpected things happening in the plot. But Gilmore Girls is just something you can watch any time. When you want to see something funny, when you're sad, when you're bored, when you feel like you need a friend and I can keep going on! It's so much fun to watch Lorelei and Rory. I really like the spontaneity and clumsiness of Lorelei. I can relate to the way she sees life and is able to see things in perspective. The other characters are great as well and fit perfectly. Luke (Owner of Luke's Diner) has such a funny impact on Lorelei I love that. Sookie is just awesome. She's so enthusiastic and full of energy! The thing I love the most about the series: The positivism. It will always you feel good / better. I love the way they look at life. Surprisingly, Gilmore Girls is something me and my mom both liked! I really like how spunky Rory and Lauren are. I particularly grew up watching Rory go through college and romance. I think if I watch the series again, I could all the more relate to it! I enjoy the Gilmore Girls as well, but then again I don't watch TV much. Less than an hour a month of TV watching. They are all over the internet, but I never watched them. Seems like an interesting story, but I have 7 season to catch up with and that means "watch it till you're done" for me haha. And I don't have that much time now. I enjoyed GG before it was take over again and relaunched this year. It was part of my childhood and I was so obsessed with the show. It was perfectly well written, and I'm so excited for the relaunched, even tho I won't have so much time to follow it along. It's not my kind of thing anymore tho! Yeahh!! Gilmore girls , it's so good!! So much fun that their back after so many years right? OK, this is interesting because I have been wondering what after the Crown and My netflix kept suggesting Gilmore Girls. I think I will give it a try now. Thank you for the heads up!